Rare Riihimaen Lasi Oy Saturnus (Saturn) vase in yellow. Signed by designer Nanny Still around base. This vase forms the smaller of 3 vases in this design. There is a possible flaw above the lower base in the form of a tiny crease in the glass above the base. Vintage Tapio Wirkkala Avena Ice Glass Vase. No: 3429. E bay automatically opens an unpaid item case after 48 hours. Alternatively the sale will be cancelled. The color of this bird is in the eye of the beholder. I do see hints of blue around the head. The last 2 pictures are outdoors unfiltered. You decide. Signed as pictured. I do see a few lines around the bridge of the head/beak. Each heavy glass, from the ‘Kaleva’ range, has a beautiful tactile quality and is made from delicate crystal clear glass with a wide disk shaped form to the weighty base. This beautiful set of six whisky or water tumblers, designed by Tapio Wirkkala for Iittala of Finland, are a highly usable set of fine quality with a great style for a modern interior. The vases striking colouration has a strikingly rich saturation of colour whereby a darker shade of Forest geen viewed to it's lower reaches. 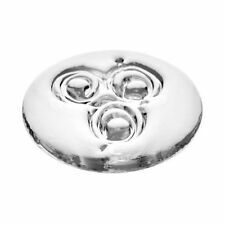 The original designer of the Disc vase has split the glass hierarchy down the middle as their are no early Riihimaki records. The vase has the studio acid etched mark on the base and the model number 1379 is inscribed. Designer : Oiva Toikka. Made in Finland, Nuutajärvi. Otto Brauer. Carnaby Gul Vase. For sale, a stunning rare two tone block vase designed by Severin Brorby for Hadeland, Norway, c1950s. A superb small vase. Australia etc. - £18.95. USA etc. - £17.95. Holmegaard art glass bottle shape vase. Straight sides with wide flared lip, smooth base. White cased with deep cherry red glass. 12 inches tall. There is some scuffing on the shoulder, visible on one side only, no other issues. See photos two and three. Scandi Glass Vase. Dispatched with Royal Mail 2nd Class. This glass has been signed but the writings so small I can’t read it Beautiful piece of glass which catches the light... fantastic. Signed to the side and base. The side us signed Ulrika HV/JP and has its original label. 37,5cm long, 24cm high, 2kg847grams! Oiva Toikka Clear Glass Bird - Signed There is a chip in the beak. See pictures. Apprx 2” tall It’s still a beautiful piece! Lisa larson Glass Fox, Royal Krona, Sweden, Mid Century Modern. Condition is Used, the fox needed to be supported to stand,please see the photos. This occurred during the production. Measurements approx9x13 cm, weight 252g. The glasses were designed for Lyngby Glassworks in 1956 and produced for a number of years after. Each glass has a finely cut stem and a plain foot in clear crystal and a finely cut bowl in green crystal with a series of diamond cuts with tiny strawberry cuts to the centres. This is a gorgeous cobalt blue fine Mid century glass vase. It has a large blown bulb base and then narrows to a very slim tall funnel neck for the flower bud. MATS JONASSON. 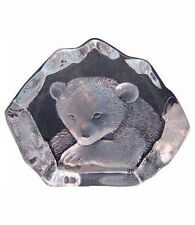 Royal Krona Sweden - Lead Crystal Paperweight. " Hedgehog ". Weight Of Glass - 450gm. Depth - m4cm. Famous and highly collectible, this full Swedish Crystal Dalecarlia Horse is made by Lindshammar of Smaland, known for exquisite art glass and crystal. Horse in excellent condition, box has light storage wear. Good Luck! From the 1950´s / 60´s period. This beautiful pieces is signed and numbered on bottom. (OTHER INFO 2-3 weeks to many locations). 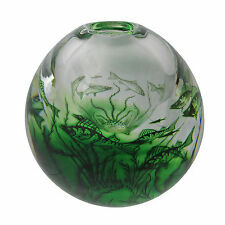 NOS Norwegian Art Glass Holmegaard Flower Bowl 7” Slightly Optic, Pretty! Impossible to photograph, bowl has very slight light blue optic effect, really nice leaf/petal details. International Priority is FAR superior in many ways, but expensive, I know. FLATWARE 1847 Rogers Bros. STEMWARE & GLASSWARE. CHINA & DINNERWARE. 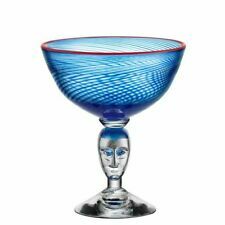 Per Olof Strom for Alsterfors Glassworks. drilled for use as a lampbase, 26.5 cm tall x 14 cm wide in Flint, signed to base 'P. Strom 69'. The box shows signs of age -- see photos. This is not marked. Beautiful condition. Condition is Used. signed TS on the underside / original IITTALA -FINLAND label present. New Holmegaard Of Copenhagen Decanter Bottle, 8.5”, Red Gold Green Gorgeous! International Priority is FAR superior in many ways, but expensive, I know. Nice Vintage Holmegaard Otto Brauer Gulvase in dark smoky green in excellent condition with slight wear from age. The Gulvase measures about 14 1/4" tall x 8" wide. This is a nice iconic Scandinavian vase that displays nicely!